Matter in the universe emits radiation (energy in the form of subatomic particles or waves) from all parts of the electromagnetic spectrum. The electromagnetic spectrum is the range of wavelengths produced by the interaction of electricity and magnetism. The electromagnetic spectrum includes light waves, radio waves, infrared radiation, ultraviolet radiation, X rays, and gamma rays. Ultraviolet astronomy is the study of celestial matter that emits ultraviolet radiation. Ultraviolet waves are just shorter than the violet end (shortest wavelength) of the visible light spectrum. This branch of astronomy has provided additional information about stars (including the Sun), galaxies, the solar system, the interstellar medium (the "empty" space between celestial bodies), and quasars. Radiation: Energy transmitted in the form of subatomic particles or waves. Radio waves: Longest form of electromagnetic radiation, measuring up to 6 miles (9.7 kilometers) from peak to peak. Ultraviolet radiation: Electromagnetic radiation of a wavelength just shorter than the violet (shortest wavelength) end of the visible light spectrum. Wavelength: The distance between two troughs or two peaks in any wave. An ultraviolet telescope is similar to an optical telescope, except for a special coating on the lens. Due to Earth's ozone layer, which filters out most ultraviolet rays, ultraviolet astronomy is impossible to conduct on the ground. In order to function, an ultraviolet telescope must be placed on a satellite orbiting beyond Earth's atmosphere. Beginning in the 1960s, a series of ultraviolet telescopes have been launched on spacecraft. The first such instruments were the eight Orbiting Solar Observatories placed into orbit between 1962 and 1975. These satellites measured ultraviolet radiation from the Sun. The data collected from these telescopes provided scientists with a much more complete picture of the solar corona, the outermost part of the Sun's atmosphere. the Milky Way. Between 1972 and 1980, OAO Copernicus collected information on many stars as well as the composition, temperature, and structure of interstellar gas. The most successful ultraviolet satellite to date was the International Ultraviolet Explorer (IUE) launched in 1978. The IUE was a joint project of the United States, Great Britain, and the European Space Agency. With very sensitive equipment, the IUE studied planets, stars, galaxies, nebulae, quasars, and comets. It recorded especially valuable information from novae and supernovae. Although intended to function for only three to five years, the IUE operated until September 30, 1996, making it the longest-lived astronomical satellite. The IUE was succeeded by the Extreme Utraviolet Explorer (EUEV), which was launched on June 7, 1992. The EUEV was designed to extend the spectral coverage of the IUE by being able to observe much shorter wavelengths. 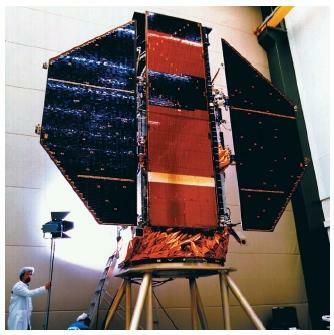 A third ultraviolet satellite, the Far Ultraviolet Spectroscopic Explorer (FUSE), was launched on June 24, 1999. This satellite also was designed to look farther into the ultraviolet (meaning to shorter wavelengths) than the IUE. With FUSE, astronomers hope to study high-energy processes in stars and galaxies in addition to exploring conditions in the universe as they existed only shortly after the big bang (theory that explains the beginning of the universe as a tremendous explosion from a single point that occurred 12 to 15 billion years ago).